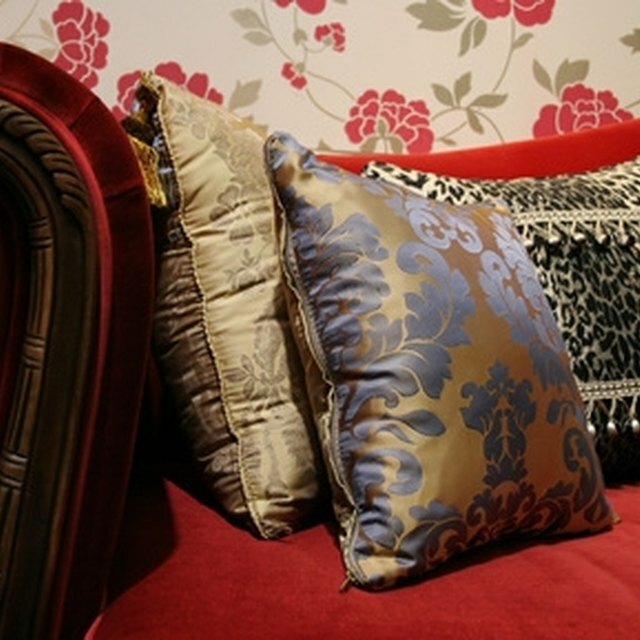 Piping adds a dressmaker touch to cushion covers and gives them a finished edge. Piping is cording encased in a bias strip. Make your own piping if you want it to match your pillow. Covering a cushion only requires sewing straight seams, even if you use piping. Make a set of pillows in several colors and embellish them all with matching piping to create a colorful, yet uniform look on a bed or sofa. Piping gives cushions a finished edge. Measure and cut a square of fabric 13-1/2 inches wide for the front of the cushion cover. Measure and cut two rectangles of fabric 9-1/2-by-13-1/2 inches that will overlap to form the back of the cushion cover. Cut a piece of piping 50 inches long, and pin it around the square of fabric on the right side of the fabric. Match the raw edges of the piping with the raw edges of the fabric. Overlap the ends of the piping 1 inch along one side. The ends of the piping should extend 1/2 inch beyond the edge of the fabric to ensure the pillow encloses ends of the piping. Attach the zipper foot to the sewing machine and baste the piping to the fabric. Stitch along the seam in the piping. Replace the original sewing foot on the machine. Zigzag stitch along one of the long edges of each of the fabric rectangles. Use a 1/4-inch stitch width. Fold down a 1-1/2-inch hem along these edges. Pin the rectangles to the piped square, with the right sides of the fabric together. Match the raw edges with the edges of the pillow. The folded-down edges will overlap in the center. Attach the zipper foot to the sewing machine and sew the back of the cushion cover to the front of the cushion cover along the basting lines. Sew as close to the piping as you can. Turn the cushion cover right side out. Pull the piping all around to shape the pillow, and stuff the pillow form into the opening in the back. Choose any fabric from lightweight quilting cotton the heavy upholstery-weight fabric for piped cushions. Line the cushions if you use lace or eyelet. Install a zipper to easily remove the cushion. Put the zipper in before cutting the fabric.